OLM Review 2019: Is OLM a Good Hosting? OLM is a privately-held hosting company based in the United States. Founded in 1996, the hosting company offers shared web hosting, VPS, and dedicated cloud services to individuals and businesses helping them create a powerful online presence. Established in 1996, OLM is a U.S. based, privately-held hosting company. With over 20 years of experience in the hosting space, this vendor has dedicated itself to helping business enterprises create a powerful online presence. Its comprehensive hosting services include shared web hosting, VPS, dedicated cloud servers, WordPress management, and domain name registration. 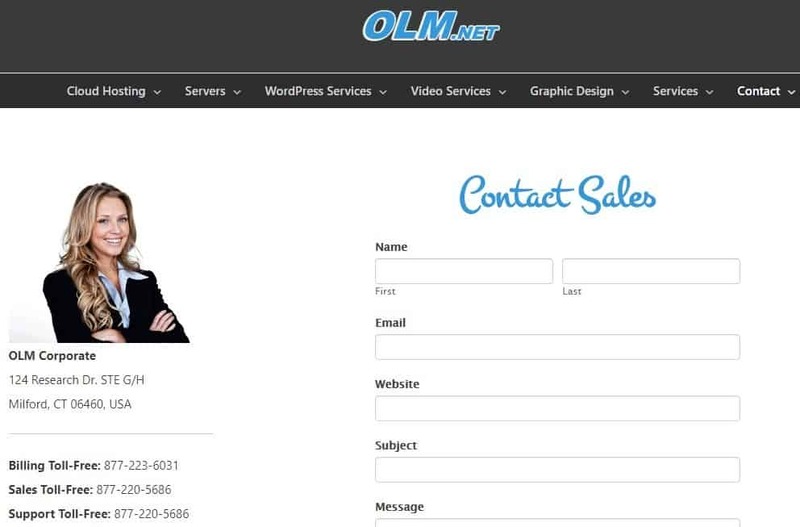 OLM also offers SSL certificates, video marketing services, web design, and WordPress security services. OLM cloud servers are hosted in a level 3 facility Telehouse data center located in New York. Servers are connected to a network of redundant fiber connections with 100 Mbit ports. This is to ensure that it provides the best network connectivity for high speed and availability. OLM cloud-based hosting packages offer safe, reliable, and fast services designed to fit a broad range of customer needs. Customers can choose either Personal, Business, or Pro hosting plans. The Personal package is the starter plan and comes with three domains, 10GB cloud space, and 2GB RAM. The premium package is the Pro plan and comes with 30 domains, 100GB cloud space, and 8GB RAM. OLM offers bespoke hosting solutions. All the same, while the vendor mentions them on its website, users have to contact its sales team for more information. OLM offers courtesy backups performed once every week. The vendor maintains that your use of this backup service is at your own risk. The downside of this backup service is that it overwrites any previous backups. This replaces older backups with new ones. What’s more, the vendor does not perform backups for websites with more than 15,000 files. Therefore, clients with lots of website files would have to outsource backup solutions from other vendors. OLM hosting prices are somewhat expensive. This is so, perhaps, because the plans are hosted on cloud-based servers. That said, the plans come with flexible monthly billing cycles. In addition, the hosting provider includes a 30-day money-back guarantee in all its hosting solutions. OLM’s 99.9% uptime guarantee ensures that its customers rarely have to deal with cases of downtime. And in the event of network outage, the hosting provider promises to credit your account with a percentage of your monthly hosting fee. Customers can contact the OLM support team via its toll-free telephone number, email, and ticketing system. The vendor has not provided a live chat on its website. The technical support team offers 24/7/365 premium support, and has a very short response time. I sent them an email and within five minutes had received a detailed response. The OLM website includes a knowledge base, however, it is has minimal information. As a veteran hosting company in the United States, OLM has learned practically all the tricks in the hosting books to deliver hosting solutions that few other vendors can match. 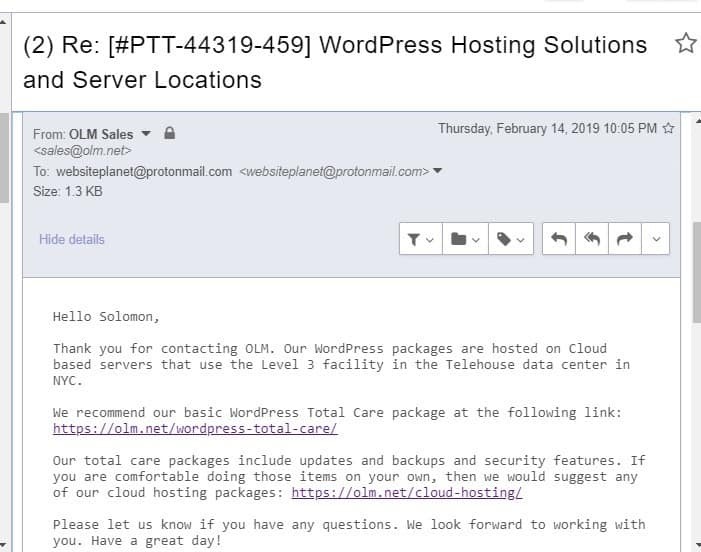 It is quite impressive to note that even after so many years in the industry, the vendor is still committed to offering premium support with an average response of less than 15 minutes. 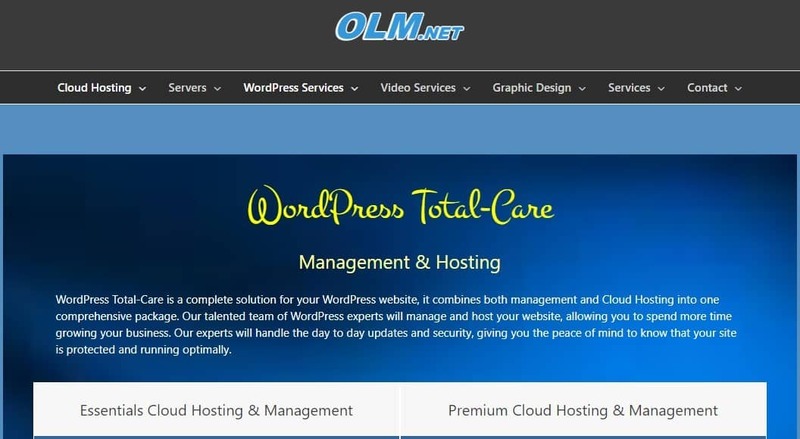 Wondering how OLM stacks up against other Web Hosting companies? Enter any other Web Hosting company and we will give you a side-by-side comparison.